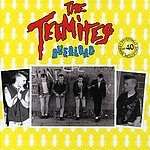 Hard-hitting Psychobilly from the legendary scottish TERMITES. A long time's gone since their debut album OVERLOAD on Link Records in 1989 and we are proud to release their second album about 20 years later. They have added Johnny Fiddles to their line-up, which gives their sound a celtic feel! Described excitedly as psychobilly, punkabilly, punk n roll, cowpunk, whatever...these guys know how to rock.